#1 Best Seller on Amazon in the Court Rules Books category! 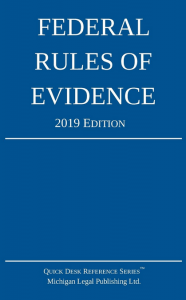 A handy pocket version of the Federal Rules of Evidence (5″ x 8″), as amended through January 1, 2019. A Perfect quick reference book for your desk or briefcase, for both attorneys and students. The 2019 edition now includes internal cross references. Each rule includes a list of other Rules of Evidence which reference that rule, assisting the reader with understanding the full scope of each rule’s applicability. Also available from Barnes & Noble or your local bookstore, just ask! You might also be interested in the 2019 Federal Rules of Civil Procedure.